We had a somewhat lazy morning as our ETA in Regensburg was not until 1:00 pm. I was thankful of a little downtime as the cold that has been dogging me for the last week, although slightly better, seems to have become more entrenched in in my chest. While it hasn’t hindered my touring, it has meant pretty much heading to bed right after supper. We went for a late breakfast and just as we were sitting down it was announced that we were 1.5 km from the join of the Main and Danube rivers. I returned to our cabin to get my camera but other than marking our passage to the third river on our trip it was somewhat underwhelming from a photo op point-of-view. The lull after breakfast gave me a chance to get caught up on writing my blog although publishing each day’s post will take a bit longer as I have to select the photos I want to add, upload them to WordPress then insert them into my blog. The last 2 steps are totally dependant upon the availability and strength of the WiFi onboard. 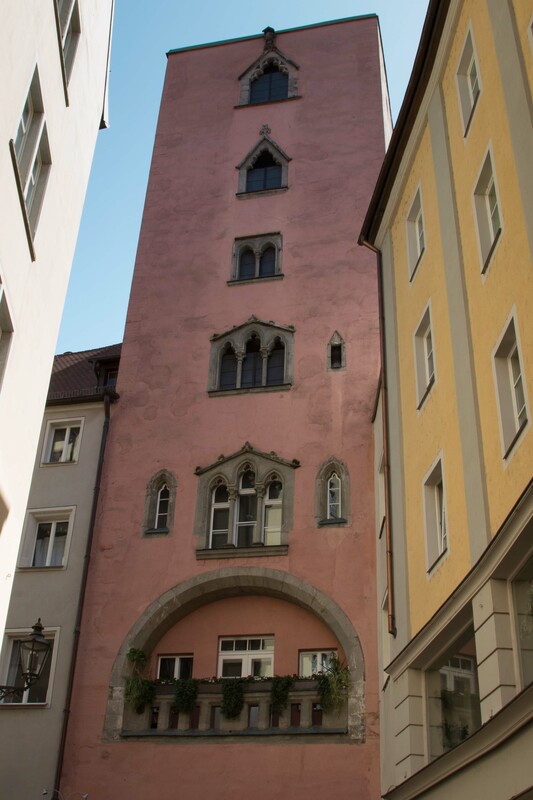 About 1:30 we disembarked for a walking tour of Regensburg. Just as we were getting lined up with our tour guide the skies opened and the rain came pelting down. It was really the first rain we’ve had during a walking tour. Fortunately it didn’t last. 10 minutes later the sky cleared and it turned into probably the nicest afternoon of the trip so far. 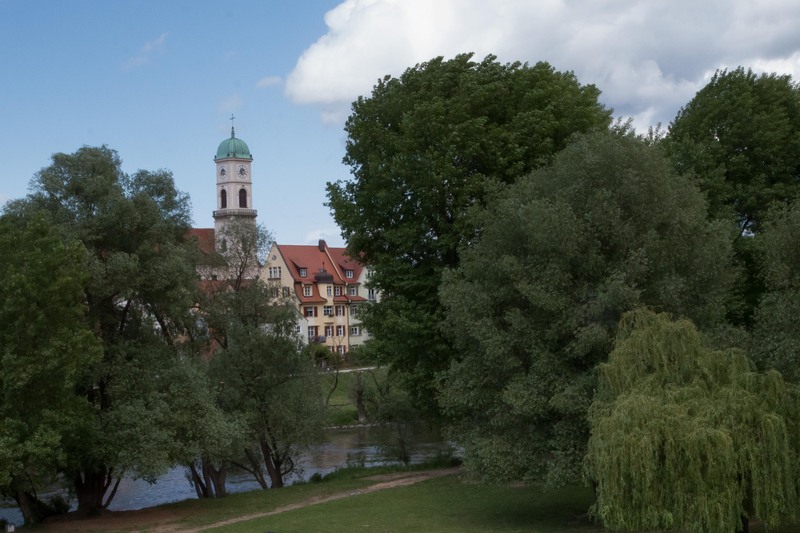 Regensburg was did not sustain any bombing during WW II: likely as it was very poor and lacked any real importance. This means the buildings are all original, not rebuilt reproductions. This has not always been the case. The city was very wealthy during much of its history and since the war has regained some of its former prosperity. We had a very enjoyable 90 minute tour around town. 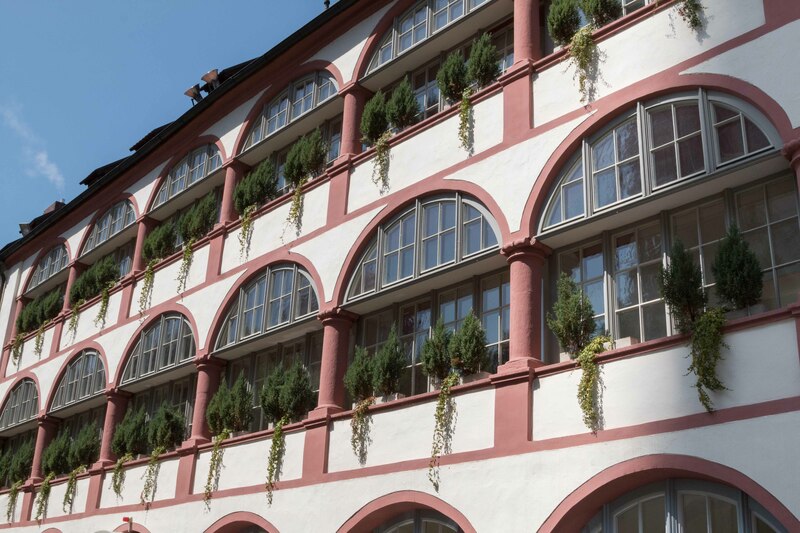 The city was originally a Roman encampment that grew into one of the important cities of the Holy Roman Empire of the German Nation. The city has become known as the city of skyscrapers due to the 80 some odd towers that once dotted the skyline. The towers weren’t used for anything other than a demonstration of one’s wealth. 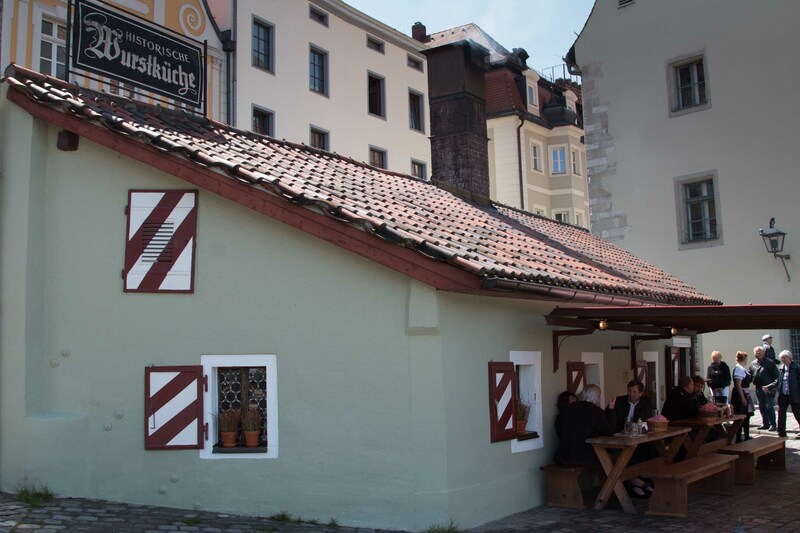 Regensburg is also known for its little sausages, made from the oldest recipe in Bavaria. 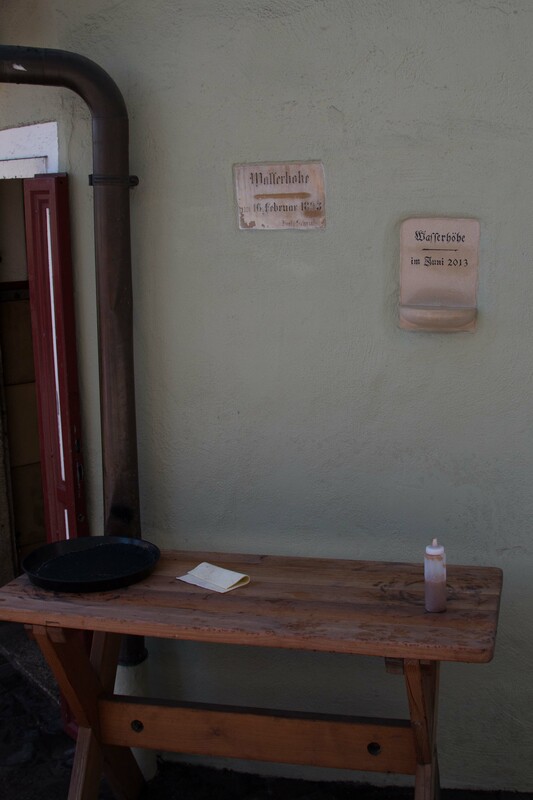 The sausages are smoked at a little restaurant that was built centuries ago, originally to feed the workers building the old stone bridge. The restaurant was flooded nearly to the top of the doorway last June but is open again for business. The tour ended in front of St. Peter’s Cathedral. For those that wanted to take full advantage, the rest of the afternoon and evening was free time to continue exploring this beautiful city. There is also a mini Octoberfest taking place. 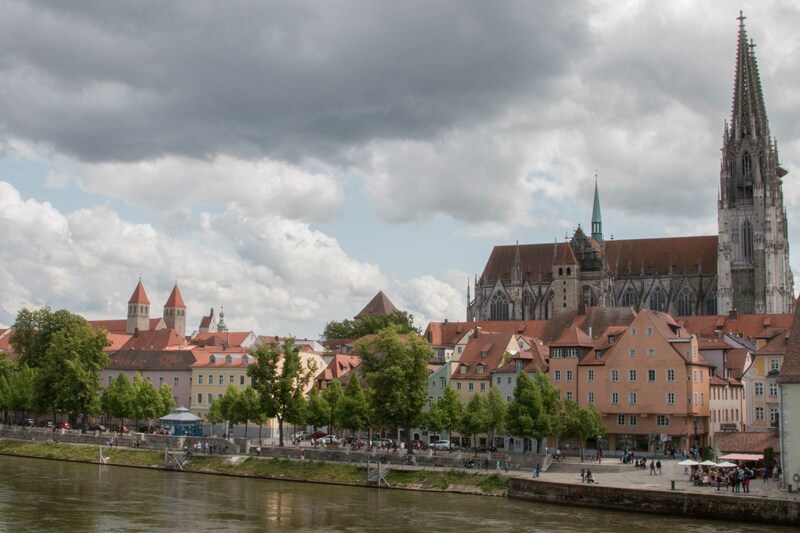 I opted to stroll across the old stone bridge to take some photos of the Regensburg skyline. I also planned to stop at a little beer garden we had passed earlier to sample some local beer; however, I missed the turnoff. By now I was feeling somewhat winded (damn chest cold!) so returned to the Skadi to relax. On a positive note I noticed that they were setting things up on the top deck again. For the past several days there has been no access to the top deck. Everything had been flattened and the wheelhouse lowered so that the boat could squeeze under the very low bridges along the Main. Hopefully the weather will cooperate now so we can enjoy the sundeck for it’s intended purpose. 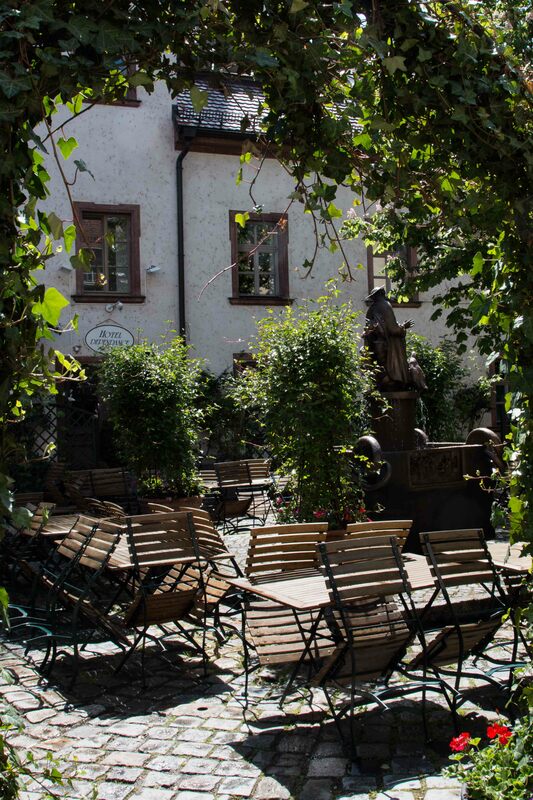 This entry was posted in Travel and tagged Regensberg. Bookmark the permalink.